This is an amazing story of an amazing artist. His passion for painting is so great, according to his therapist he wants to paint 24/7 without eating or sleeping. I find his paintings of Singapore River very good. SINGAPORE: For nearly 35 years, Mr Sim Kah Lim’s world has been the walls of his ward at the Institute of Mental Health (IMH). Outside, changes have swept the landscape, old buildings falling and new ones rising – skylines and shorelines of a 21st-century nation transformed. 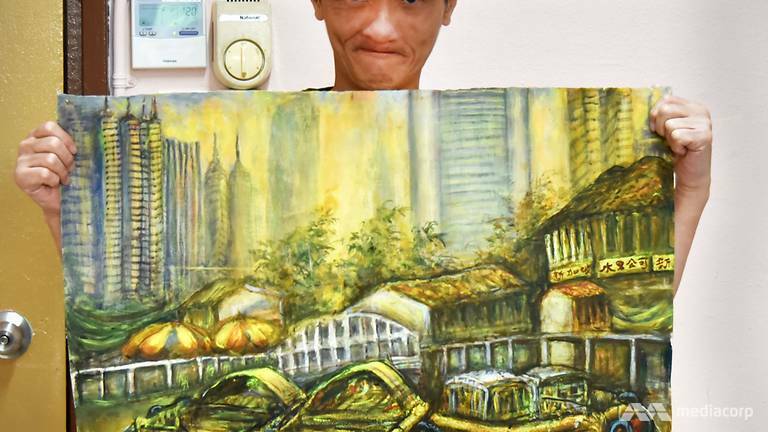 But in his mind’s eye – and in his bold-stroked acrylic and watercolour paintings – Mr Sim’s homeland is one where bumboats still crowd the Singapore River, ferrying goods and passengers; and where Chinatown’s open-air markets thrive and its five-foot ways are bustling with locals, not tourists. They are pictures, frozen in time and memory, from early childhood when his father used to take him to these places. “My father brought me outdoors (for) painting. 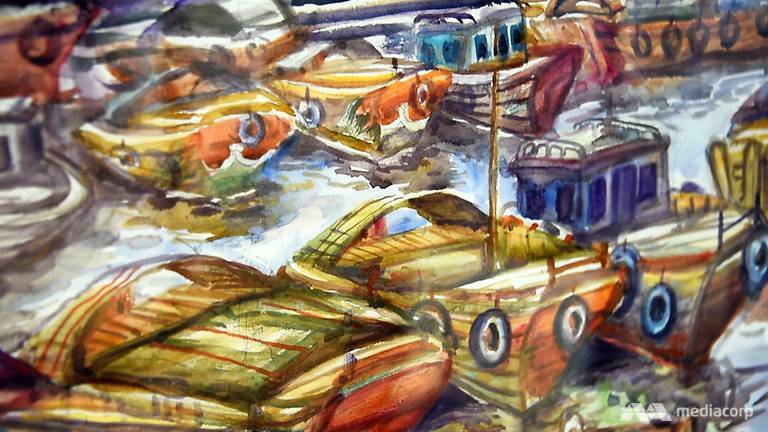 I saw the Singapore River and all the artists,” the 50-year-old said, words spilling out without pause in a torrent of English and Mandarin, sometimes incoherent and muddied, like the river of his paintings during monsoon season. It’s through his art that he finds order, focus and clarity in expressing himself.